This video is from Send a Cow, a U.K. philanthropic organization created by a group of British farmers. 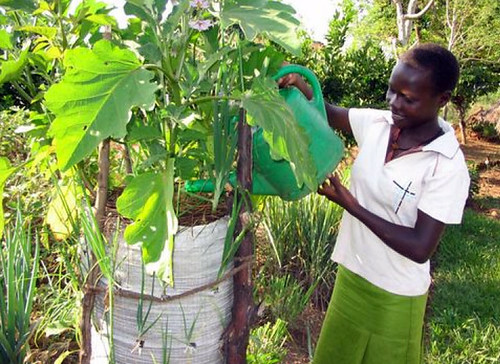 They work in Africa teaching some highly productive methods of gardening to provide food self-sufficiency and in many cases extra earnings for low-income African families. I admire both their work and the gardening methods they teach using indigenous materials. The video in this prior post demonstrated sack gardening on a parking lot in Wisconsin. It is one of the two main methods taught by Send a Cow. These sack planters are a vertical gardening method that works well in small spaces, with no need for tillable land. Concrete or blacktop in the sun is fine. 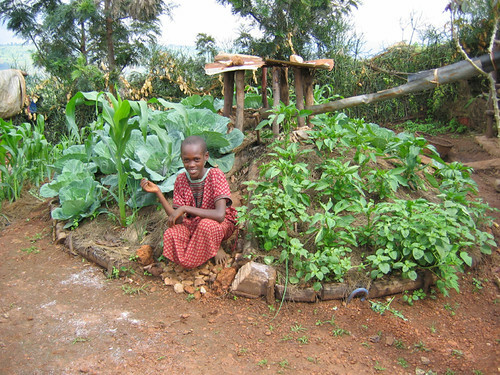 The other method taught by Send a Cow is an African version of a traditional raised bed called a keyhole garden. The keyhole shape provides access to the water, oxygen, and nutrition column in the center of the bed. Functionally it is a larger version of the sack planter. The basic principles of both the sack and keyhole gardens are good plant science and can be the basis for planters more suitable to the built environment in larger more industrialized cities. I have thought through several versions of these gardens that would be more durable and most likely be even more productive. All that is needed is some space and warmer Spring weather here in Brooklyn to test the ideas. Stay tuned.